Is your neighborhood among the best in Kansas? State budget woes have made it tougher for communities to count on receiving the transportation funding they’ve been promised. Is this a hole state officials can dig themselves out of? Steven Scott has a full-time job, being president of Pittsburg State University, but there are days when he must feel like a part-time highway commissioner. Case in point: His travels took him to Washington, D.C. this summer to advocate for his college not too long after he attended a meeting devoted solely to stalled improvements to U.S. 69, a key southeast Kansas highway link. So he expanded his agenda, making sure that federal officials heard about how important the highway is to town and gown. “I’d say for Pittsburg State – our future – that road building is absolutely critical,” Scott says, explaining that previous enhancements to U.S. 69 dramatically increased the number of students that Pittsburg State draws from Johnson County. 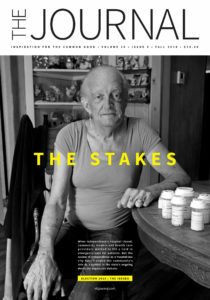 Scott and other U.S. 69 advocates aren’t alone. The ultimate plan is to complete a four-lane highway that connects the Kansas City metro area with Interstate 44 in Oklahoma. Across Kansas, public officials, the construction industry and impatient residents are pushing to restart a highway program that ground to a halt under former Gov. Sam Brownback. About $2 billion was transferred out of the state’s highway fund to cover budget shortfalls that followed Brownback’s 2012 tax cut, resulting in 23 highway projects being indefinitely delayed. The state has announced that no new projects would be begun in 2018 or 2019, although maintenance work would be continued at a reduced pace, partly funded by money borrowed through bonds. Although the Kansas Department of Transportation categorizes 90 percent of the state’s roads as being in good shape, Michael White of the Kansas Contractors Association says they’re starting to show their age. What’s harder to dispute is that some communities saw projects put on the back burner because of budget woes. Some of the bigger delayed projects include $93 million in work on Kansas 14 in Reno and Rice counties; $69 million for U.S. 50 in Gray and Ford counties; $46 million for U.S. 166 in Cherokee County; and $44 million for U.S. 54 in Seward County. 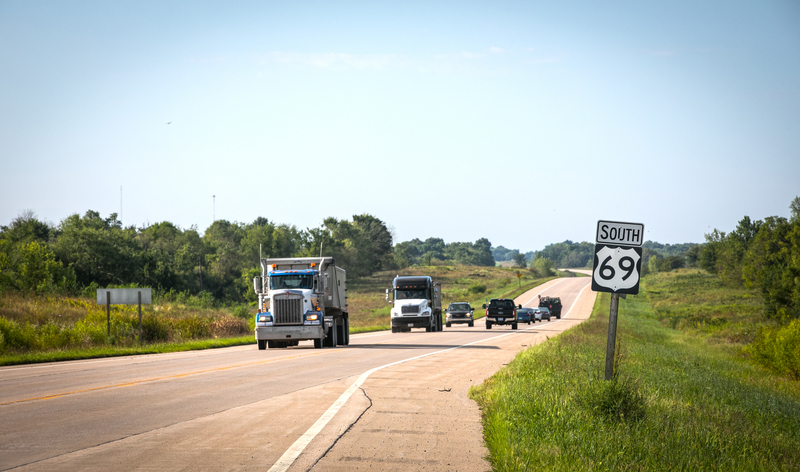 To residents of southeast Kansas, finishing the upgrade of U.S. 69 from a two-lane road to a four-lane divided highway makes sense because it will make the route safer and should help foster economic development. But for Pittsburg, there’s another reason. It’s the only city with a Regents university that’s not served by a four-lane road. Brownback justified the use of highway funds for other purposes by saying that 90 percent of the state’s roads were in good shape, a result of decades of steady investment. In the wake of the delays, some quarters of the state – especially southeast Kansas – complained that too much of the money that was available went to projects in population centers such as Sedgwick and Johnson counties. Unlike education funding, which the state is obligated to provide, there is no legal requirement that Kansas improve its roads and bridges, or provide money for such improvements. Highway money is still being diverted to the state’s general fund nearly a year after Brownback’s departure, although at a slightly lower rate. Several solutions have been suggested, including raising the fuel tax, charging more tolls and, of course, stopping the transfer of highway funds. A transportation task force headed by Proehl and Sen. Carolyn McGinn of Sedgwick County is to hold a series of meetings across the state and then make recommendations to the Legislature next year. Proehl says it’s unrealistic to think the state can catch up on $2 billion in highway spending all at once. The first step will probably be reducing the size of any additional transfers from the highway fund. Pittsburg was actually luckier than some regions that saw promised highway projects delayed. The Department of Transportation, at Brownback’s urging, reinstated a $25 million widening of U.S. 69 from K-7 south to the Bourbon-Crawford County line, a distance of about six miles. The work is underway now. That leaves just 11 more miles of planned work on the highway from the Bourbon-Crawford County line south to K-47. From K-47 south to Pittsburg, U.S. 69 is already four lanes. Brownback’s successor, Gov. Jeff Colyer, announced earlier this summer in the run-up to the August primary election that the state would take care of those remaining 11 miles, too. It’s unclear what impact, if any, Colyer’s loss in the August primary will have. But it doesn’t change the underlying pressures impacting the state’s system. As long as that’s the case, history suggests that roads of good intentions don’t always wind up paved. Pittsburg State’s Scott noted that a Pittsburg business leader is a member of the transportation task force and U.S. 69’s backers have already spent a lot of time talking to Proehl, its co-chairman. Correction: A previous version of this article misstated the status of highway work in southeast Kansas. Work there is currently under way to widen U.S. 69 to four lanes from K-7 south to the Bourbon-Crawford County line, a distance of about six miles. The work is expected to be completed by the beginning of 2019. Earlier this year, Gov. Coyler announced that U.S. 69 would also be expanded to four lanes from the Bourbon-Crawford county line south 11 miles to K-47. From K-47 south to Pittsburg, U.S. 69 is already four lanes. A version of this article was originally published in the Fall 2018 issue of The Journal, a publication of the Kansas Leadership Center. To learn more about KLC, visit http://kansasleadershipcenter.org. For a subscription to the printed edition of The Journal, visit klcjr.nl/amzsubscribe. This entry was posted in infrastructure and tagged budget, highways, infrastructure. Bookmark the permalink.